The City Select LUX is Baby Jogger’s most versatile pushchair to date, offering the potential of over 20 ride configurations to suit you and your growing family. The Select LUX can easily be transformed from a single to a double / tandem pushchair with the addition of the second seat unit (included). Improving on the classic City Select, the Select LUX is 30% smaller when folded and features an auto lock system, making it easy to store and transport. 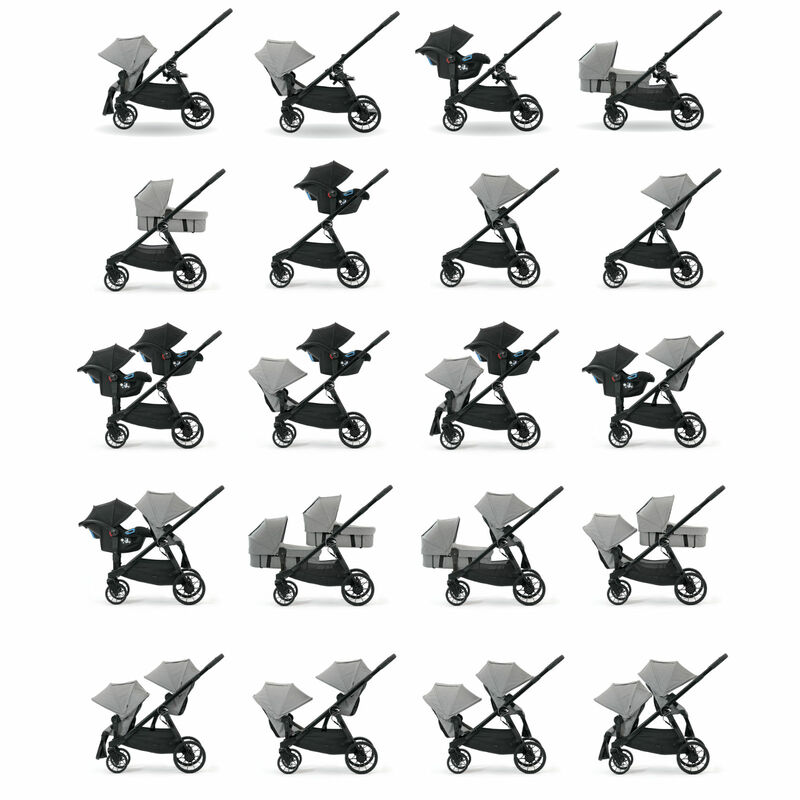 The seat units folds with the pushchair and conveniently folds inwards so they stay clean. A unique and innovative hand-operated decelerating and parking brake is located within easy reach, allowing you greater control over the pushchair, letting you slow down quickly and safely (great for use on hills). As a true all-terrain pushchair, the City Select LUX features front (lockable) swivel wheels, full suspension & large lightweight (yet durable) wheels so it preforms well even over uneven ground. The telescopic handlebar adjusts in height whilst a huge basket and seat-back pockets provide generous storage space for baby’s essentials. The seat units offers multiple recline positions and adjustable calf supports. They are fully reversible so children can sit forward facing, parent facing or any combination of the two, depending on their mood. The expandable UV50+ canopies offers superior protection from the sun’s harmful rays and include peek-a-boo windows with magnetic closures which allow you to keep an eye on your little passengers. Baby Jogger’s huge selection of Select LUX accessories allow you to customise your ride with additional elements such as a child’s tray, parent console, raincover and even a bench seat and glider board for older children (all sold separately). 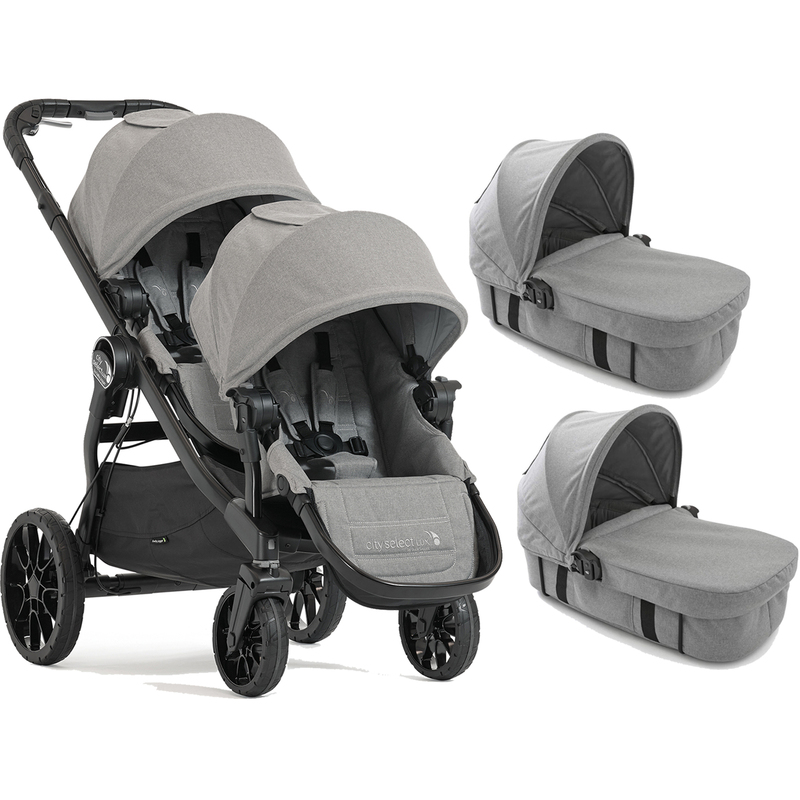 Included, comes x2 Baby Jogger City Select LUX Carrycot Kits, which are used to transform the (City Select LUX) pushchair seat units into a lie-flat carrycots which are suitable from birth. The newly formed carrycots then secure to the chassis in the same manner as the seat units did, converting it from a double pushchair to a newborn double pram.